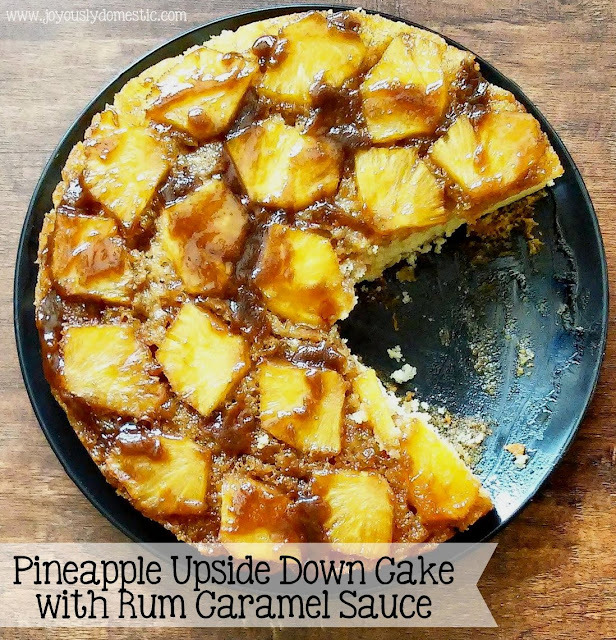 I've amped up the flavors of a basic Pineapple Upside Down Cake recipe by adding a little splash of spiced rum to the caramel sauce here. And, I've ventured off the path of traditional canned pineapple by going "fresh" for this version. Dark brown sugar is swapped instead of light to bring some additional depth to the sauce. Note that this particular recipe, also, is a semi-homemade one. Total timesaver. A boxed cake mix is used, but between the buttery caramel sauce and rum flavor seeping into the cake as it bakes along with an upgrade to one of the ingredients called for on the box, the cake turns out just as awesome as one completely from scratch. You'll be replacing the water called for on the box with a combo of juice and milk. Typically, I would add some of the pineapple juice to my cake batter when using canned pineapple. But, using fresh fruit meant that I didn't have that luxury. Instead, I used some 100% pineapple-orange juice along with milk in place of water. The juice doesn't overpower anything, but does lend a nice subtle flavor that is appreciated. And, the milk makes the cake a little more rich and decadent. Much to the disappointment of my children, I withheld the maraschino cherries that I usually intermingle among the pineapple slices, but, of course, you could add a few in if you'd like. NOTE: The brown sugar/butter "sauce" can be totally made without the addition of rum, if desired. It will still taste amazing and turn out wonderfully. Coat a 9" round (or similar) cake pan with non-stick spray. Set aside. In a medium mixing bowl, combine cake mix, eggs, oil, juice and milk. Whisk vigorously by hand or beat with electric mixer for around two minutes. Set aside. In a small saucepan set over low heat, combine butter and brown sugar. Once butter is fully melted, allow sauce to simmer for 3 - 4 minutes and until sauce is mostly smooth. Remove from heat. Stir in rum. Pour sauce into bottom of baking pan. Spread to coat bottom of pan. Arrange pineapple slices as desired, but in a single layer. Pour batter over pineapple slices. Spread evenly. Bake 35 - 38 minutes or until toothpick inserted in center comes out clean. Remove from oven. Allow to cool in the pan for, at least, three minutes, but no longer than five. Place a cake platter or serving plate over the top of the pan. Invert carefully. If any hot caramel or pineapple pieces remain in pan, transfer them carefully to the cake as desired. NOTE: The "look" of this cake (presentation-wise) is best if served immediately. However, the flavors are more-developed and the cake continues to take on some of the moisture from the pineapple/sauce once allowed to "sit" after inverted onto serving platter for a few hours. So, the choice for service time is completely up to you. Cake is best eaten within 24 hours.